Babies, the Movie – Your Chance to Win! To know me, is to know my glowing subsequent endorsement of anything the Divine Ms Oprah Winfrey has pressed her gold seal of approval to. So when I sat down to watch an episode dedicated to the lives of four newborns, found from the four corners of the globe, in the fascinating new documentary “Babies”, I knew this would be a movie I’d also put on my “must see” list. Directed by award-winning filmmaker Thomas Balmès, and not surprising hailed as the cutest film of the year, we meet Bayarjargal from Mongolia, Mari who resides in Japan, Ponijao who’s home is the dusty desert of Namibia, as well as the blue eyed girl Hattie, who hails from the USA. 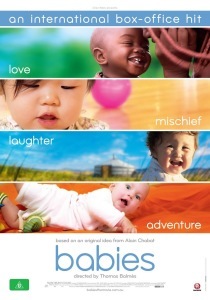 Free from subtitles and translations, it focuses on their individual journeys “from first breath to first step”. It is compelling viewing, giving an amazing insight in to the vastly differing childhoods these lifestyles offer. And while we all may have varying methods of parenting our precious newborns, the common denominator is love. It is present in beautiful abundance no matter if you live in a thriving metropolis or an isolated safari plain. So, now for you Sydney based readers, the good news. Thanks to Madman Entertainment I’ve five family passes (admitting four people per pass) to give away to a special preview screening of this masterpiece movie, being held on Sunday May 1 at Event Cinemas Macquarie Megaplex. All you need to do is be a follower of my blog, and leave me some comment love telling me one of your own all time favourite memories of that first year of your child’s life. The winner will be selected by Random.org at 1pm Monday April 18, 2011. I’m not Sydney based (sob sob) but I ranted and raved about this movie when it was released in the US and after watching the trailer three million times I bought a copy from overseas. I just had to have it. It’s brilliant! I’m not in Sydney..but it sounds like a movie I’d go and see.